Racin’ Today » Nationwide Rolling Toward Tough Times? Baker, who along with partner Mike Curb are in their second full season as owners of Baker Curb Racing, last year were forced to make personnel cuts. They also lost their driver and crew chief. “It’s the challenge of challenges,” said Baker, who has been involved in racing for three decades as a driver, track owner and team owner. He is increasingly frustrated over having to battle long odds in every race – including Saturday’s Nationwide 300 on his home track of Nashville Superspeedway. Baker said he would like to field a second car in addition to the one driven by Jason Keller, but sponsorship is not available – because Cup teams have siphoned them off. Baker said that if the situation continues unchecked, some Nationwide teams will be fighting for survival. A stale economy combined with the growing Cup dominance has dealt the Nationwide series a double blow. “It’s certainly not getting any easier,” Baker said. Cup drivers have won all five Nationwide races this season and 94 of the last 110 dating back over three years. Cup drivers have dominated the Nationwide championship standings for more than a decade, and this season is starting out no different: Cup regulars Carl Edwards and Kyle Busch are already pulling away from the pack. The good news for Nationwide teams is that Saturday’s race is the season’s first stand-alone race (no companion Cup event) which means the field won’t have its usual flood of Cup double-dippers. The bad news is that the five Cup drivers who are entered are formidable: Edwards, Busch, Joey Logano, David Ragan and Michael Waltrip. Edwards has won three Nationwide races on the 1.3 mile concrete Superspeedway, while Busch has captured two of this season’s five events. “At least there’s not 22 Cup guys entered, like there has been in some races,” said Keller who is 9th in the standings, 259 points behind Edwards. While the hill is steep for Nationwide-only teams, Keller said he has extra motivation this weekend: the race is on his team’s home track. 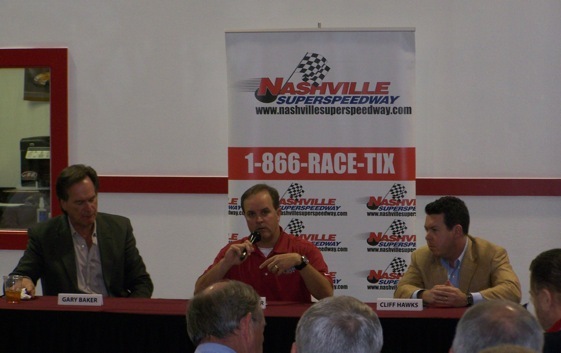 Superspeedway vice president/general manager Cliff Hawks makes no apology for structuring most of his media advertising and promotions around the Cup stars. Baker said he has lobbied NASCAR for help, perhaps limiting the number of Cup drivers in a Nationwide race, but with no luck. Great website guys!! Alot of my favorite writers all in one place! would you go to a race where you didnt know anyone who is driving?? ?i didnt think so…and if it ever happened, the track owners will make you buy a ticket to the nationwide race with your cup ticket…they arent going to have only 10,000 people show up to a nationwide race because then they make no money…i cant imagine going to dover or louden just for a cup race,,, thats to expensive for 1 race only…but why would i buy a ticket to watch a crashfest of 18-20 year olds for 60-80 dollars when i could go to a local track for 10 dollars…..just because hefty, or a big sponsor is on the side of someones car who i dont know and will never see in the cup series…i go on saturdays to watch the cup boys race not to see eric mclure and aguilar,and rusty’s kid….they need to earn it,just like everyone else….not have it handed to them and beat lesser compitition…. I wonder what he will be saying when he no longer has a series because his much loved ‘star power’ has caused the smaller teams and startup teams give it up because they can’t get sponsors? NASCAR could make this problem go away in short order by allowing only so many entries and races per season by the big boys. But they won’t because they also are wedded to the concept of star power. Oh well, my Saturdays and Sundays can be used for more enlightening activities.